Friday, 27. February 2009 Rhein Chemie, the additive specialist for industrial lubricants, is extending its product portfolio. Many of today’s lubricants are required to fulfill extreme thermal demands for several application fields. The new ADDITIN RC 63-series of Additins provides excellent wear protection, good oxidation protection and high load-carrying capacity. As a result of their high thermal stability (above 300 °C), they are capable of meeting the increasingly severe requirements placed on high-performance lubricants. 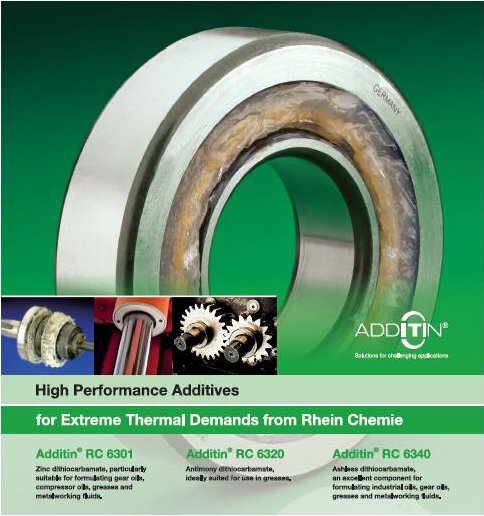 The Additin RC 63xx series consists of three multifunctional additives. ADDITIN RC 6340: Ashless dithiocarbamate, an excellent component for formulating hydraulic oils, gear oils, compressor oils, turbine oils, high-temperature chain oils, greases and metalworking fluids. Due to their high thermal stability the three carbamates are capable of meeting the increasingly severe requirements in the relevant application fields and are therefore a very beneficial addition to Rhein Chemie’s product portfolio. Rhein Chemie is a chemicals company which has had a successful track record in customized additives and service products stretching back over 100 years. The approximately 850-strong workforce produces and sells products for various sectors of the rubber, lubricant, plastics, and polyurethane industries worldwide. The company is headquartered in Mannheim-Rheinau, Germany and has subsidiaries and production facilities in Europe, Asia and North and South America. Rhein Chemie is a wholly owned subsidiary of LANXESS Deutschland GmbH, Leverkusen, Germany.